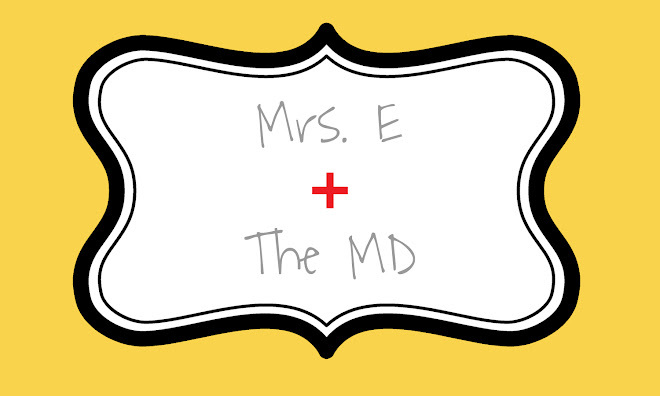 Mrs. E and the MD: Hi, I'm Ashley...Remember me? As I hear the rhythmic sound of Noelle's swing going back and forth, and as I see my sweet baby girl snoozing in her seat, I say to myself..."I NEED TO BLOG!" I don't think I have gone this long without blogging in a super long time. I apologize. I owe you two, soon to be three, Tasty Tuesdays...which means tomorrow I am planning a three course meal to make up for it! I know you are on the edge of your seats. I just rested my hands on my belly the way I did when I was pregnant. Difference is...I am not pregnant. Don't plan on being pregnant for quite a little while. Yes, my belly is still hanging around for the long haul. I keep telling it that it no longer is Noelle's happy home, and it can go away and be gone forever, but it does't want to listen. I admit, I have been slacking. I haven't done the Shred in about two weeks because I simply don't have time, and when I DO have time, I most certainly do not have the energy. I plan to get back in the saddle when summer break rolls around (in a mere 7 school days...but who is counting?). I have set a goal of booking a family portrait session with a great photographer (yet to be named...suggestions?) in September for Noelle's 6 month pictures. This will encourage me to get in my best shape and look as good as possible while having something to look forward to. Think I can do it? Speaking of photography, I am really jonesin' (I like that word) to get back into it. This time, I want to focus on little kiddos. I think it would be so fun to continue to see children in all phases of their lives and photograph them in a beautiful way. So, I am gonna start this Friday with a beautiful little boy of a friend of ours, and I can't wait to post about it! What else? What else? I am thankful that I have a job in this horrible time for teachers. I am thankful that I have a loving husband in this difficult time for some couples I know. I am thankful to have parents and in-laws who stepped up to watch the little girl while I went back to work. I am thankful to have friends to laugh, vent, and celebrate with. I am thankful that summer is just a few days away for me. Oh yeah...and that baby girl? She's so amazing. Thankful is not a good enough word for how I feel about her. Honored? Awe-struck? Amazed? In love? Humbled? It all fits. Life isn't perfect right now, but it's good, and I'm happy.